We know that this list doesn’t do justice to the wonderful year we had — what were YOUR favorite OAA moments of 2014? Let us know in the comments section! The Nanka Kenjinkai Kyogikai (Japanese Prefectural Association of Southern California) is now accepting applications for its 2014 scholarship for outstanding students of Japanese culture (e.g. art, entertainment, martial arts, etc). Qualifying applicants must be current members of a kenjinkai, between 17 – 27 years of age, and a dedicated practitioner of a Japanese cultural tradition. Applying consists of a recommendation letter from the instructor of the Japanese cultural tradition, a recommendation from your kenjinkai, transcripts and passport photos. If you are a member of OAA and interested in applying for this scholarship, please contact the OAA at 310-532-1929 or mensore @ earthlink . net (please remove all of the spaces in the email address). The scholarship application deadline to be considered as an OAA nominee is July 31, so please contact us as soon as possible! On Sunday, May 5th, the Okinawa Association of America (OAA) will be presenting their 18th biennial Utayabira Wuduyabira concert at the James R. Armstrong Theatre (Torrance, California). Translated as “let’s sing, let’s dance” in Uchinaaguchi (the Okinawan language), this showcase of traditional performing arts will feature local musicians (sanshin, koto, taiko) and dancers coming together to celebrate and share the Okinawan culture for audiences of all generations and backgrounds. Utayabira Wuduyabira is organized by the OAA’s Geinobu (Performing Arts Committee). The Geinobu was formed in 1987 and is currently comprised of over twenty Okinawan dance, sanshin, koto, and taiko schools. Teachers and students from each school participate in the Utayabira Wuduyabira concerts, bringing a blend of koten ongaku (traditional music), buyo (traditional dance), minyo (folk music), and eisa (festival drums). The Utayabira Wuduyabira concert will be hosted by the James R. Armstrong Theatre (3330 Civic Center Drive, Torrance, 90503) on Sunday, May 5th, 2:00 PM. Tickets are $20 and can be purchased by contacting the OAA at mensore@earthlink.net or 310-532-1929. Please make checks payable to OAA – Geinobu. Please join and share our Facebook event page! The Okinawa Association of America (OAA) will be hosting an informal talk with Shinichi Maehara on Saturday, March 23, 3:00PM at the OAA Center (16500 S. Western Ave. Gardena 90247, FREE ADMISSION). The event will be the first in an ongoing series of lectures presented by the OAA’s Bunka-Bu (Culture Committee). Mr. Maehara, a retired executive director at Okinawa Television (OTV), will be discussing the preservation and sharing of the Okinawan heart and spirit by the Okinawan diaspora. 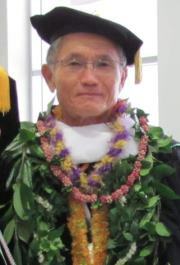 In 2011, Mr. Maehara received an Honorary Doctorate of Humane Letters from the University of Hawai’i at Mānoa. The honor was given for his contributions to the understanding of the Okinawan diaspora. He traveled to 35 countries to document the lives of overseas Okinawans, compiling those interviews into a series called “Sekai Uchinanchu Kikō (Uchinanchu Worldwide)”. Inspired by a Ryukyu Shimpo newspaper series of the same name, Mr. Maehara’s documentary series ran from 1987 to 2001 and in 2004, totaling 206 episodes and earning an award from the National Association of Commercial Broadcasters in Japan. Equally educational and entertaining, the episodes focused on Okinawans living in different countries and presented the scenery and native cultures of those countries. Even though the interviewees moved away from Okinawa (or were born outside of Okinawa), Mr. Maehara found many commonalities that were linked by their shared Okinawan roots – the strong presence of Chimugukuru (the Okinawan heart and spirit, an attitude often characterized by universal family and acceptance) and the practice and sharing of the Okinawan culture and language. This free event will take place at the OAA’s Yamauchi Building (16500 S. Western Ave. Gardena 90247). Please RSVP by calling the OAA at 310-532-1929 or emailing mensore@earthlink.net. Scholarship to Study in Okinawa! DEADLINE: October 15th! The 2013 application for the Kempi Scholarship to study in Okinawa is now available for interested persons. This unique and incredibly wonderful opportunity has been around a long time, but has changed and expanded in the past few years. For more information or to obtain a copy of the application, please contact Yuko in the OAA office as soon as possible. The latest issue of our newsletter, Haisai OAA News, has been completed and delivered to OAA members on our mailing list. Compiled and edited by Kristin Yamauchi, the Haisai OAA News features English and Japanese articles detailing our recent events/activities.